Ryan Gosling is the main character in this strange, dreamlike, and relentlessly violent film that seems to have come out in theaters 25-30 years after it was filmed. I say that because it screams early 80's in the worst way. Now come on everybody it wasn't made in the 80's (Gosling would've have been in his toddler years), but everything from the soundtrack to the opening credits suggests that director Nicolas Winding Refn wanted that type of feel. 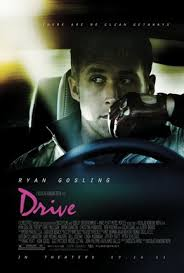 Drive tells the story of a Hollywood stuntman (played by Gosling) named "Driver" (his name is never mentioned in the film) who's a stunt driver by day and a getaway driver by night. His third job is working in a auto chop shop for Shannon (played by Bryan Cranston). Shannon is connected to a mobster named Bernie Rose (played by Albert Brooks). Bernie sees potential in "Driver" and has his people build a stock car for "Driver" to race (Gosling's character might also have a fourth career in the works). "Driver" also connects with a young woman named Irene (Carey Mulligan) who's husband, just out of prison, gets called back to the criminal life to do a heist. Things get complicated when the heist goes wrong. Without giving too much away, all the characters above mentioned, are all involved/connected and that's when the film gets darker. It basically becomes a completely different yarn that you thought it would be. But lets get back to the star, Ryan Gosling. As I said earlier, his character has no name. Throughout the film, his screen presence suggest that he was born to play this role. He holds a toothpick in his mouth, doesn't say much, and acts with his eyes and facial ticks. It's an underplayed performance but it's darn good. He owns the screen so much that when he's not on camera, you'd think the movie committed a felony. However, when the camera is not on him, it's on Albert Brooks. I'd have to say the Brooks performance shocked me. I'm used to seeing him in a comedic role, but after seeing Drive, you'd think he'd do the bad guy thing more often. He plays an absolutely horrific, nasty, despicable human being so brilliantly, it's ridiculous that he didn't get nominated for an academy award for best supporting actor. To be honest, I would have given Drive a four star rating had it sustained its brilliance for its full running time of 100 minutes. But after one of the most exhilarating opening scenes in movie history, the film peaked too early. It wasn't what I expected. Granted, it is a slick and entertaining vehicle for the director and the stars involved, but the concept of a car chase here and there followed by scenes of brutal killings and uncomfortable silences between the characters is in my mind what kept Drive from greatness. The violence is this film is more of a form of art than your typical movie violence. It's more gratuitous than any of the key scenes call for. The director obviously didn't care what anybody thought. It's was his vision and he ran with it. Take Drive for what its worth. 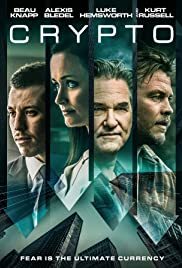 If you got out a blender, turned it on, and threw in Repo Man (1984), Taxi Driver (1976), and the recent Tom Cruise flick, Jack Reacher (2012), this is the concoction you would come up with. As a movie it's retro, it's disturbing, it's mysterious. Ultimately, it's the movie equivalent of a car accident that you can't look away from. I recommend it, just not for every movie going demographic. Lets just say Drive is your ticket, if you can handle the wheel.